Observation - Round -leaved Sundew - UK and Ireland. Description: The Sundews are insectivorous perennials. They digest the proteins from the small insects they trap, probably to supplement their nitrate nutrition because their normal acid bog habitats are nutrient-deficient. 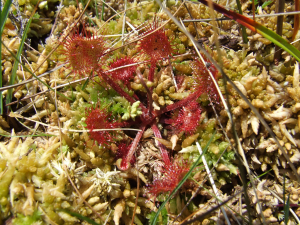 The Sundews are insectivorous perennials. They digest the proteins from the small insects they trap, probably to supplement their nitrate nutrition because their normal acid bog habitats are nutrient-deficient.